A US mother has been arrested for murdering her two-year-old son after his body was discovered more than two days after he was reported missing. Jordan Belliveau's body was found in woodland in Largo, Florida. His mother, Charisse Stinson, had told police a man had attacked her, knocking her out. 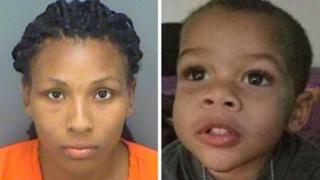 Ms Stinson told investigators that when she had come around, she was in a park and could not find her son. She later admitted injuring the boy and leaving him to die, police say. Police believe Ms Stinson, 21, lied about being attacked when she said initially that she and her son had been picked up by a man who offered them a lift in his car. The driver went on to hit her, she had said. However, when questioned, according to police, she admitted hitting her son in the face with the back of her hand "in a moment of frustration" while they were at home on Saturday night. His head struck a wall and the injury caused "seizures... resulting in his death", the police report says. The mother is further said to have admitted taking her son to woodland afterwards and leaving him there. Jordan's body was finally found on Tuesday. "This was a sad end to Jordan's life," the Largo police department said in a statement. Ms Stinson faces a charge of first-degree murder and is currently being held without bail.